I’ve overlooked the River Ridge Track until now. I’ve never had an obvious reason to use it from the Holdsworth Road End, but I suppose the main reason it exists is for people wanting to cut the corner and not visit the road-end. Maybe someone coming from Totara Flats and aiming for Atiwhakatu. I began climbing at about 10am. 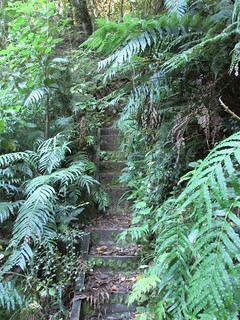 The climb itself, up to the main track near Pig Flat, is around 400 vertical metres. That’s in the space of 1500 horizontal metres so it’s hardly flat, but it wasn’t as bad as I feared from the way it’d been described to me. 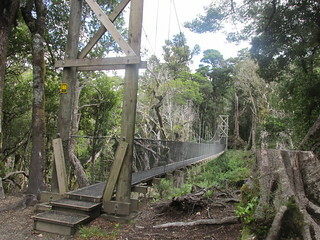 If you’d entered the Tararuas for a stroll along what seem to be increasingly well-maintained tracks of the Holdsworth Jumbo Loop, then this track would be something of a culture shock. Out of that context, though, it’s really not very different from a regular Tararua grind. Up a hill that’s covered in tree roots. It took me about 35 to 40 minutes of climbing to the edge of Pig Flat. 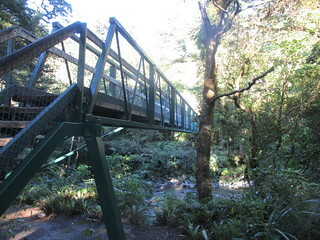 The top of the River Ridge Track is relatively new. An older track veers off and dissolves into the top of a significant slip, but obvious markings, and indentations in the ground, make it easy to find the route through to the incoming Gentle Annie Track at the end of Pig Flat. Two minutes further along is Mountain House Shelter, where I stopped for a few minutes with an intent of refilling some water. 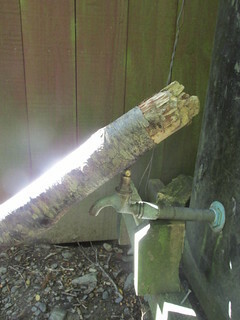 Someone had left a heavy log leaning on the tap, which piqued my interest. Upon lifting it, the tap immediately spun several revolutions and water gushed out onto the ground. I caught most of it, but replacing the log onto the tap in the exact-right place so as to prevent any more water escaping was a challenge. Probably the water would be gone from the tank before long, as soon as someone made a mistake with resetting it, so I made a note to report this to DOC upon return (as if nobody else would have). 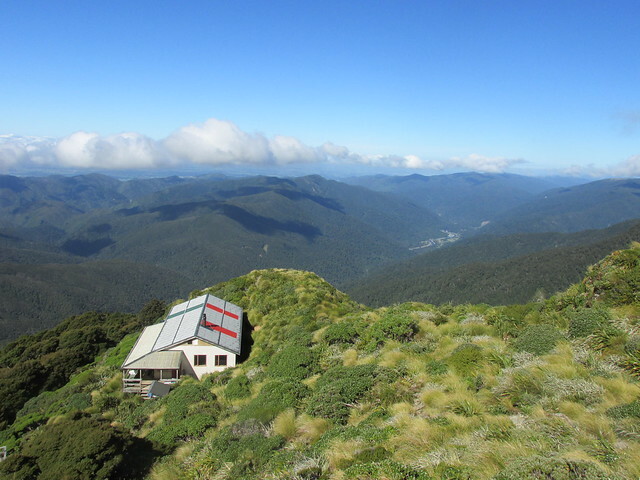 With Mountain House behind me, I continued with the climb towards Powell Hut. 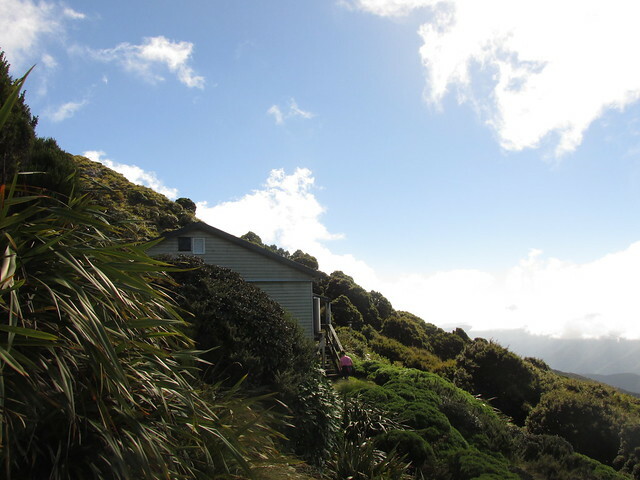 It’s another 470 vertical metres of climbing to Powell Hut. If my memory’s correct then DOC has done considerable maintenance on this section of track since I was last here, most obviously by manufacturing steps that seem to be more direct and exaggerate the gradient. 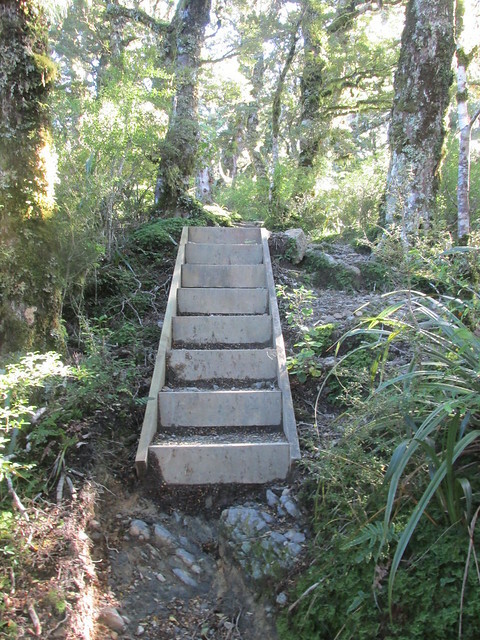 It felt steep, but I managed to cover the section in about 45 minutes, arriving at Powell Hut at 11.35am. Looking across towards High Ridge. 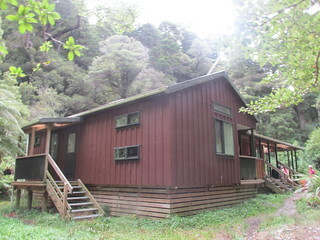 Within a few minutes of arriving I could see people arriving ahead of me, and compared with nearly the almost nobody I’d seen on my walk so far, Powell Hut was a hive of activity. It was probably too late in the morning to be meeting anyone who’d stayed the previous night, but there were several collections of relatively young people hanging around, mostly presumably having come up from the Holdsworth road-end on this first morning of the long weekend. 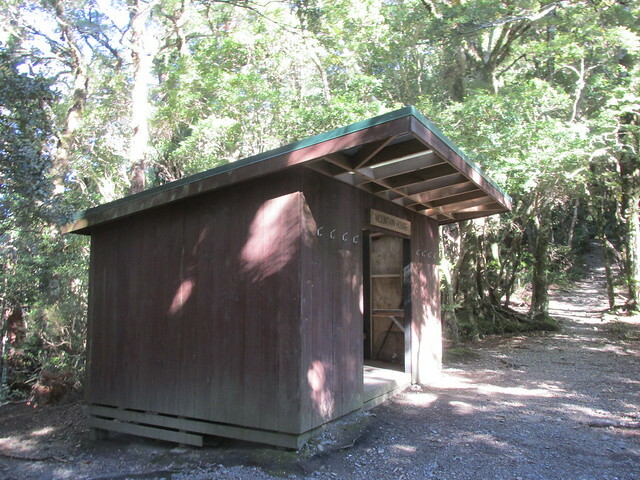 I filled up my water bottle, scribbled in the hut book, checked the time (11.40am) and began climbing up towards Mt Holdsworth. By this time I was in a line — at least two people were visibly ahead of me, and soon after I left another couple left behind me. 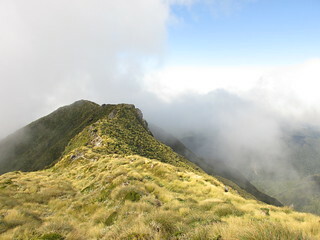 Looking over Powell Hut towards Totara Flats. 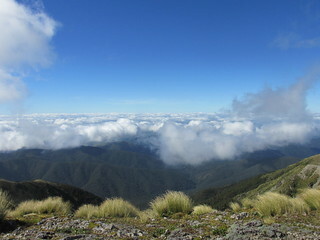 From Powell Hut upwards is relatively sub-alpine, and the day’s temperament allowed warm, calm and clear visibility in all directions. This made it a pleasant climb for the remaining 250 vertical metres to Mount Holdsworth. It took me about 30 minutes to reach the junction just below the peak. The route towards Jumbo doesn’t cross over Holdsworth Peak, but it’s a 30 second diversion. I climbed to the trig where another collection of people were sitting, eating and taking photos. I greeted them, checked how I was going for time (12.10pm), neglected to take a photograph, and decided things were good enough for me to continue with my ideal plan towards Jumbo. I didn’t want to push my luck though, so after a very brief stop I turned began the descent towards the east, eventually north, along the tops. It was a fab day for it. Looking down the East Holdsworth spur. 20 minutes later, at about 12.30pm, I passed the top of the East Holdsworth track. This was one of my alternative route options for returning to where I’d begun from, but with things going so well there wasn’t a need. I glanced down the ridge to see a group of three people descending, and suddenly realised that everyone else had vanished. For all the people who’d been at Powell and on Holdsworth Peak, there was suddenly nobody obviously in front of me. I turned back and apart from the point of the Holdsworth trig in the distance, there wasn’t anyone obviously behind me, either. 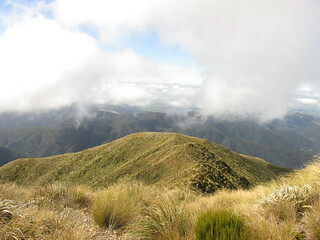 The route along the ridge between Holdsworth and Jumbo is mostly straightforward to follow, in the context of tussock and mud and ongoing undulation. This isn’t too surprising given how popular it is. There was only one short stint where I had to briefly double-back having followed a false ground trail through the tussock. I’d tried to drop down beside an outcropping instead of looking for a route over it, and I think I even recall doing the same thing when I was here years earlier. Looking into Angle Knob, from roughly near .1367. 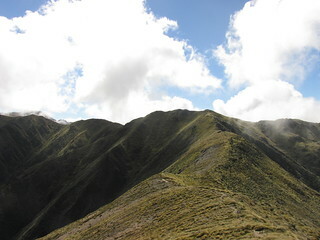 Looking east, from just below Jumbo. I briefly hopped back up to the top of Jumbo, then turned to follow the couple who’d by now begun their walk past me and towards Jumbo Hut. I left at 1.40pm, from where it’s only a relatively short walk to Jumbo Hut. Once again there was a small collection of people settling in, presumably (but not necessarily) having come up from Atiwhakatu since this morning. I briefly greeted people, scribbled in the hut book, filled my water bottle, and left. There are a couple of options from here. 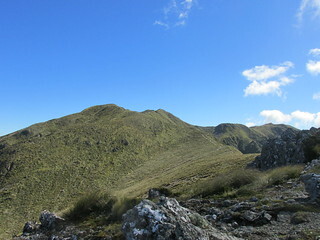 One goes in an eastward direction, the other in a south-east direction (Raingauge Spur), and both drop to different points of the track alongside the Atiwhakatu Stream. Last time I followed this loop, in a group, went the former way. 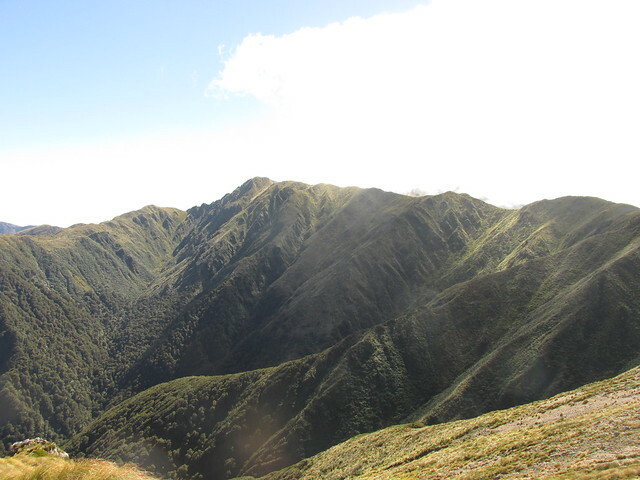 That’s a longer route because the point it meets in the valley is further away from the end point of Holdsworth Lodge, but in my opinion is’s also a nicer walk… possibly because I think it’s less walked than Raingauge Spur that goes directly between Atiwhakatu Hut and Jumbo Hut. I’ve not been on Raingauge for a very long time, though, so that’s where I went today. 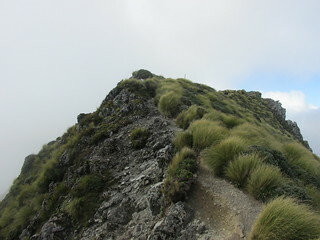 Raingauge is also not a bad walk, but it’s typically Taraura steep. For a downhill direction, this means lots of rubbing on the toes, and after some time I began to wish I’d taped them or worn different socks. By now I was meeting a few of the people aiming to stay that evening at Jumbo. This began with a fairly large group of people, at least one of whom was concerned that the weather forecast might not let them continue onto Powell Hut the next day. I showed her my map and suggested that if they really got stuck, they could try walking down the alternative route so they’d at least not be directly backtracking. I also met another couple, one of whom was walking in to act as the Jumbo Hut warden for the days and nights over the long weekend. 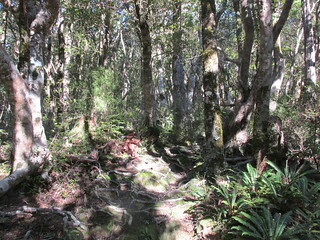 We had a brief chat about where I’d been, and then I continued down to Atiwhakatu. 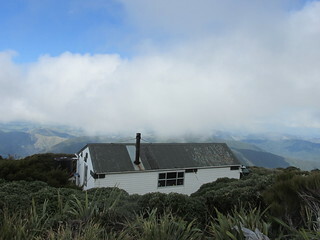 Ultimately I’d left Jumbo at 2pm and arrived at Atiwhakatu Hut at 3pm, so the descent (including stopping and chatting) was almost exactly an hour. I greeted a few people hanging around the hut, scribbled in the hut book, had a brief look around, and left. From here it’s mostly a coast along the track alongside the Atiwhakatu River, whilst traversing a diverse range of bridge types. 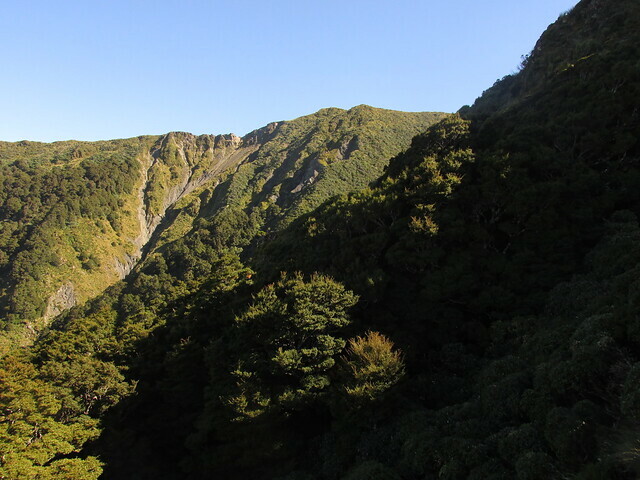 Being later in the day, I passed several groups of people heading towards Atiwhakatu Hut, for the most part being desperate to know how much further they had to go until they reached their destination for the evening. At 3.55pm I passed the base of the River Ridge track, and from that point I was back on a track I’d followed this morning. With just a short distance remaining, I diversified slightly by walking around the opposite side of Donnelly Flat than I’d been this morning, but other than that I was getting to a point of feeling ready to finish my walk for the day. 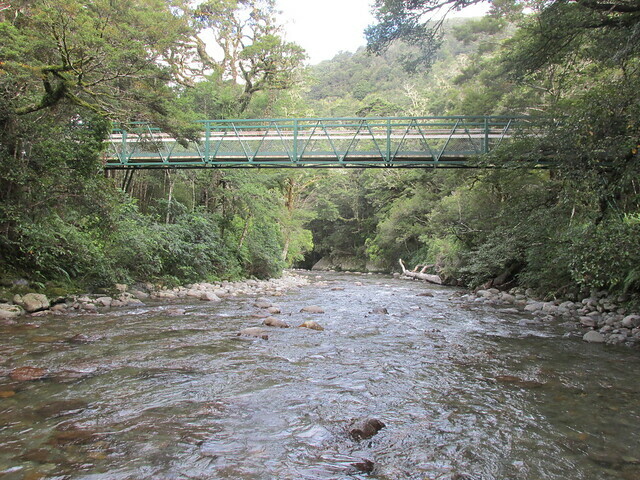 At 4.35pm I reached the bridge over the Atiwhakatu River, immediately next to Holdsworth Lodge. For a change I dropped down to the river, put my feet in and waded across. Not a bad way to finish off a day’s walk. 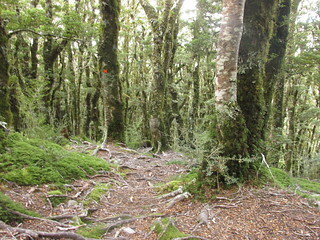 This entry was posted in daywalk and tagged daywalk, independent trip, tararuas. Bookmark the permalink.